Pop up shipping container bar and street food (with video story). 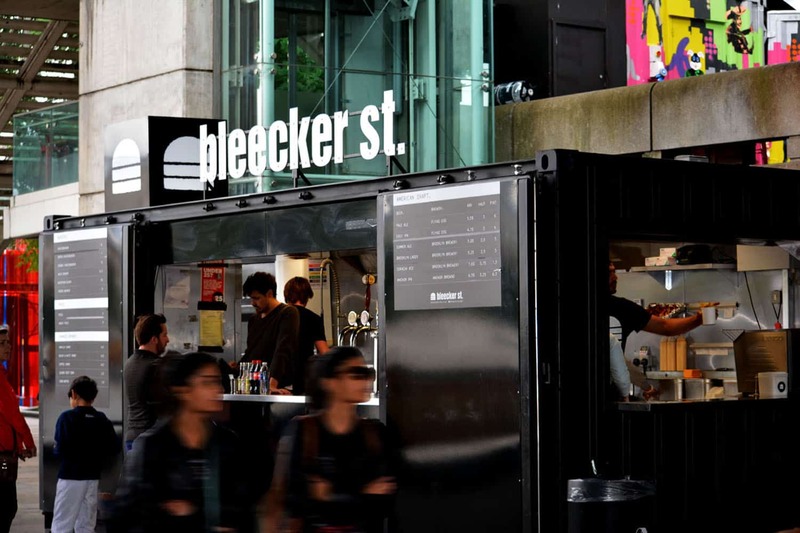 You are here: Home › Container Conversion › Pop up gourmet burger bar container. 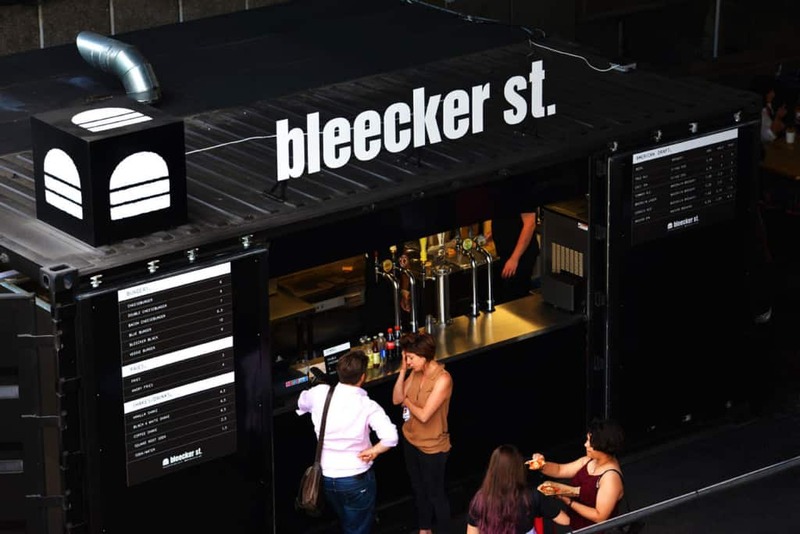 Pop up gourmet burger bar container. Shipping container converted into pop-up street food spot. 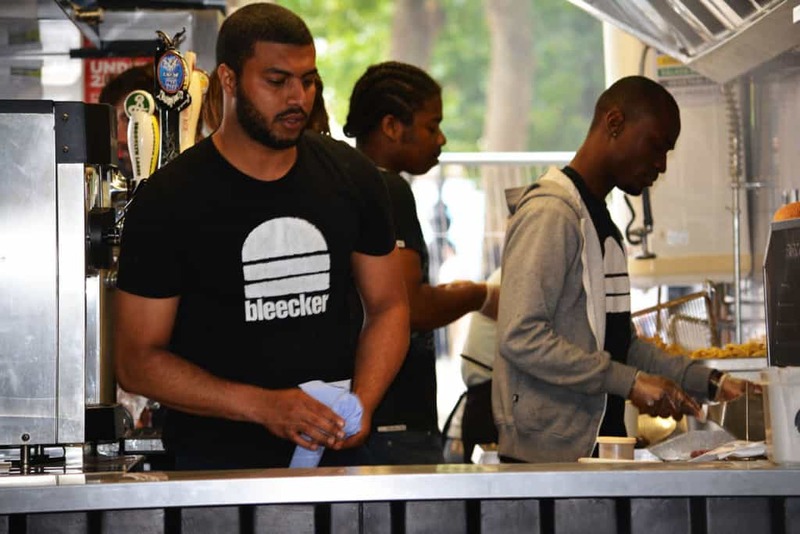 After moonlighting at a burger restaurant, lawyer Zan Kaufman decided to leave her office job behind and open a pop-up street food business. 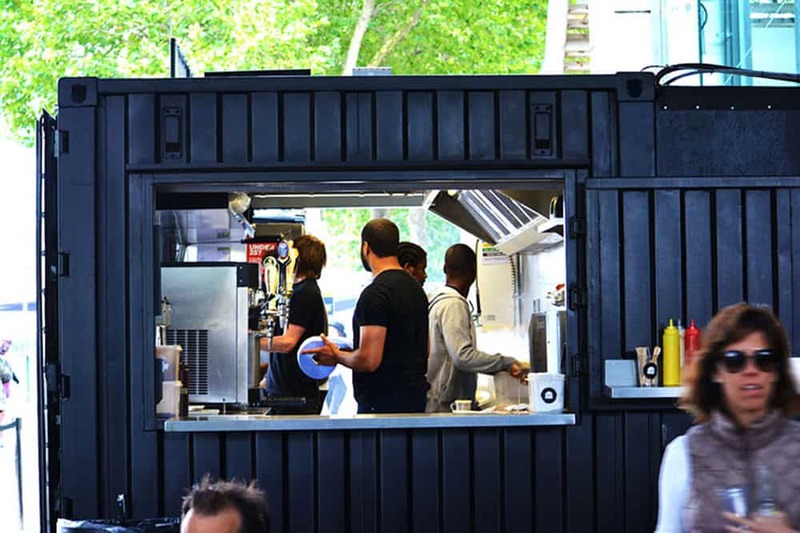 She liked the idea of using a converted shipping container to make the food sales mobile, along with keeping a fixed location in London’s fashionable Shoreditch. Adaptainer recommended that Zan use one of it’s 20ft full side access containers with some extra modifications made. Pop up shipping container design is attractive to entrepreneurs who want mobility. The container was originally built for loading and unloading oversized cargo, so it has doors that open along almost the entire side of the box, as well as cargo doors at one end. Jon Clark of Adaptainer says buying the full side access container helps customers save on bespoke conversion costs ‘its design is ideal for pop-up entrepreneurs’. Inside the pop up container bar there’s enough space for multiple staff to work. An aperture was also cut on the container front wall and created an extra serving hatch. This meant food orders could be taken from the side of the box and then served to customers from the end where a seating area’s located. 20ft full-side access container converted into pop-up food unit. The container was re-painted in matte back which matched the company’s black and white branding colors. Rob Machin who manages the unit said ‘I just love the look of it, people are taking photos all the time’. He gives a quick tour inside the unit, which was fitted out by design company Tessuto. 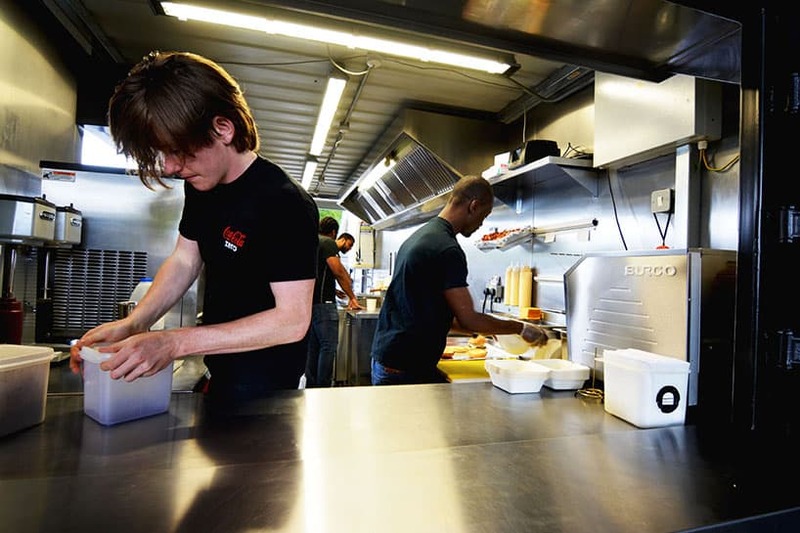 Its compact layout includes a grill, electric fryer, 2 refrigerators, milkshake maker, draught beer taps and surprisingly enough space for the 5 staff working there to move around. This custom serving hatch was created in the Adaptainer workshop. Rob moved to London around 4 years ago and started living on a boat, but had to leave when he started working on a food truck as couldn’t live and work on 2 mobile things. He laughs and says he needs one stationary part of his life. 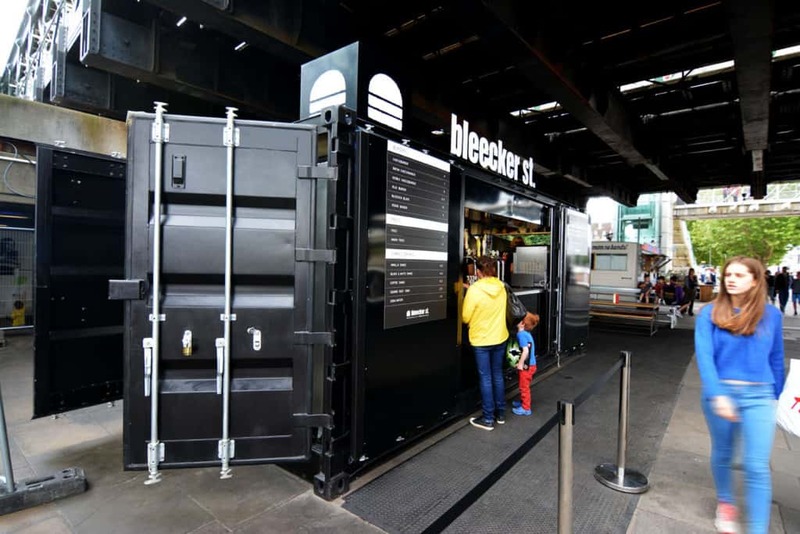 You can see more Adaptainer container conversions (including restaurants and bars) here.